Unfortunately I can’t say that I’ve managed to get distracted by something and end up cycling into the river. Sorry to disappoint. On Sunday afternoon, I went for a cycle ride with my girlfriend, Andrea out along the River Gipping following the river as closely as possible. We got some of the way out, then as river heads out of Ipswich past the sea defences the path narrows and is no longer suitable for cycling on so we found a nice spot in the bushes and locked the bikes to the bushes and continued on foot. A couple of hours later we got back from the walk [map]. 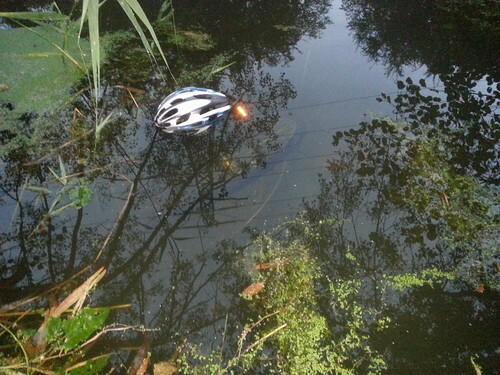 I noticed a helmet in the water, looked at the other side of the path and realised that it was the point that we had left our bikes, at which point my girlfriend pointed out that it was her own helmet that was in the water. On closer inspection I noticed that there were two wheels beside the helmet and that it was our bikes that had been thrown in. I took off my shoes, socks, trousers and jacket and slipped carefully into the river. It was slightly scary as I didn’t know how deep it was going to be or what else was going to be in the river. The edge of the river turned out to be about waist height and the river got deeper going further into the centre. I was quite surprised at how warm the water was, as I was expecting it to be colder. With the help of Andrea on the bank we managed to drag the bikes that were still chained together back onto the river foot path. The bikes have some minor damage: my Brooks saddle including the seat post, the rear light on the bike rack and the top of the bell are all gone. The light and saddle would have both needed tools to get off, as I’m sure the water wouldn’t have loosened the nuts and bolts. My girlfriend’s bike has lost the lights, and a tire has gone soft. Hopefully we’ll both have working bikes for our trip up to Scotland next week, particularly with Andrea not having a spare bike. This entry was posted in Cycling, travel on October 8, 2012 by smsm1986. Time for Rowntree’s Randoms story…. There once was a pink headed tortoise who went fishing with the help of his whistle to catch a button and a padlock. Afterwards he went for a beer with his friend, the tortoise. On his way home he got scared when he found some big paw prints. Luckily he had a tennis racket with him to be able to scare the big red R away. He then got an ice cream to help him recover from the scary experience, while he made a jigsaw with a picture of a fish on it. This entry was posted in travel on August 4, 2012 by smsm1986. On the weekend of the 9th until the 11th of September I organised a cycle trip to Belgium as part of the LCC/Bromley Cyclists. There was quite a lot of interest, however due to various things turning up at work, and schools going back, only one other person came along, who I’d never met before. On the Thursday late morning I headed out to cycle as much of the way to Dover as I could manage within a reasonable time without tiring myself too much on my own. I randomly chose my route to some degree as I went, with as little help from my GPS map as possible. On the way I poped into Bromley Cycle Repair to have a little natter with a couple of friends and a lovely cup of tea. When I got to just before Rainham I decided to take the train to Canterbury as otherwise I’d arrive in Canterbury far too late to be able to meetup with Gregory Williams, an OSMer and local cycle campaigner that I hadn’t met in ages. He gave me an interesting tour along a new cycle path out to the West of Canterbury, that I had walked part of the way along a couple of years back with another friend. After dinner I headed back on the train down to Dover to the guest house that I was staying in for the night, so that I could add an extra day of cycling, and also not have to get up too early for a train to Dover. I cycled a total of about 50 miles on the first day. On Friday morning after breakfast I headed down to Dover Priory station to meet my cycling companion for the trip for the first time, before heading down to the docks to check-in and get on the ferry. 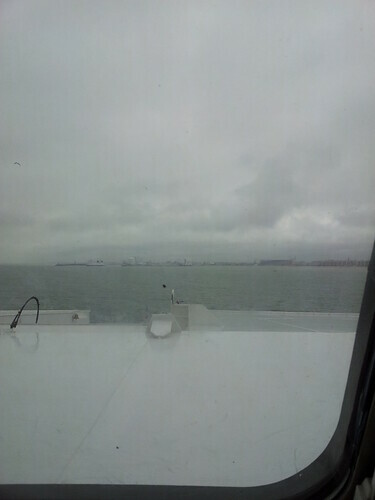 The ferry journey was pretty uneventful. We set off north up the coast. I took a little diversion off the routes that I have used in the past and went a little further inland and found this lovely cycle path that ran parallel to the main road, however it seemed to be going too far in land for where we were going. A little further down the road my companion had a little mechanical failure on his bike with the crank arm coming loose. We needed an allon key a size larger than either of us had. While we were stopped to take a look at the problem a French cyclist came past and took a look. He had a check to see if he had the tool that we needed, which he didn’t, he was then helpful in miming directions to us, with some help from my companion’s broken French. We found a garage (though not the Renault one he directed us to) and managed to ask to borrow the tool needed. About 10 minutes further down the road, the same problem reappeared, so we found another garage and properly tightened it this time. We came across a Decathlon so popped in and bought the tool needed, just in case the same issue occurred again. Next mechanical issue was a puncture in my companion’s bike, where something had gone through the sidewall of the tyre. We stopped and changed the inner tube, then about ten minutes later he had another puncture at the point of the split in the tyre, thus we stopped again and replaced the tube. As we were pumping up the tyre, I noticed it bulging, so decided to put some cardboard from the inner tube packet inside the tyre at the split in the tire to stop it bulging. This allowed us to get the next 30 miles to Oostende until we could get a replacement tyre the following morning. The cycle into Dunkirk is a much nicer experience than cycling in the UK as there are cycle lanes of a reasonable width most of the way, motorists are a lot more patient and closer to the town centre there are cycle paths separating you from the motor traffic. We grabbed lunch in Dunkirk from a nice little sandwich shop. We continued heading up the coast to our accommodation in Oostende for the next two nights. We timed it quite well for arriving in the hostel, as another cyclist had just checked-in before us, and was also looking for dinner, so once we’d parked our bikes for the night in the hostel and dumped our bags, we headed out. This guy was pretty insane with the amount that he knew about bikes, and the amount of cycling that he done. He is a Dutch postman, and was pretty shocked to hear that the Royal Mail in the UK were getting rid of bikes for their posties. It was a pretty pleasant 65 miles that we cycled on the Friday. Route taken. On the Saturday after breakfast in the hostel we headed up the coast from Oostende and stopped at a Steak restaurant overlooking the beach in Zeebrugge. It was quite interesting to spot a real pub bike with beer on tap, unlike the pedibuses in London. After lunch we continued up the coast into the Netherlands until we hit the LF1, otherwise known as the North Sea Cycle Route, at which point we started following it south and headed inland towards Brugge. At one point just after turning onto a canal towpath I stopped to take a photo of a sign and my companion wasn’t looking where he was going crashed into the back of me breaking my chain case clip. We managed to find some elastic string on his backpack which allowed the case to be strapped together and me to continue using the case for the journey back home. After a few more days the string broke and I had to use masking tape to hold it together until I could get a replacement. As we were cycling south it suddenly got noticeably colder, further on my companion noticed a flash of lightening. Then it started getting very dark rapidly and ahead we could see it raining. As we were passing a village on the other side of the canal the first drops of rain started. As we stood by a bridge deciding whether we should continue on to Brugge and probably get soaked or to find shelter in the village the rain started to come down more. We headed to the nearest restaurant and sat the very heavy thunderstorm out as it took half an hour to pass over us. We were very glad that we didn’t try to continue. From there into Brugge was pretty dry, with just the odd spots of rain. We pretty quickly found the central square to get our dinner. On sitting down and being handed the menu the waiter gave a long passage which just sounded like garbage, my companion was just nodding along going yeah, yeah, we’ll have that. I had to ask the waiter to repeat in English, and he said “Oh sorry I thought you were French”, thanks to my companion’s constant broken French whenever he was talking with the locals. After dinner I decided that it would take too long to cycle back to the hostel that we were staying, such that we got there at a reasonable time and were still awake the following day for the cycle back to Calais. The guy behind the counter wasI cycled 57 miles on the Saturday. Saturday’s route. Sunday was fairly uneventful. We took a more inland route for the first part back that took in some canal and part of the North Sea Cycle route. It was a very strong head wind, which I found rather tiring and found it very difficult to get any speed going along. The strong wind did mean that we ended up taking the ferry after the one that we were originally booked out, which wasn’t an issue since we had open return tickets. Whilst we were waiting to board the ferry, we got talking to another larger group of cyclists that had been over in France for the weekend on longer cycle rides than what we done. They were surprised at the size and weight of my Dutch bike, and started a game of see who can lift it. They all found it much heavier than their own bikes, even without the panniers. They were missing a little trick in lifting things like a bike in a way such that the weight is balanced across both hands works better, so if they’d picked it up differently, it would have been easier. We had just missed a train so had over half an hour to wait for the next one back into London due to be late evening. On the final day I had cycled about 60 miles. Sunday’s journey. This entry was posted in Cycling, gps, travel on October 25, 2011 by smsm1986. On some longer distance First Great Western trains they have an entertainment carriage in coach D. This is the Live map feature which attributes CloudMade maps that highlight the rail lines. The attribution fades after a few seconds. 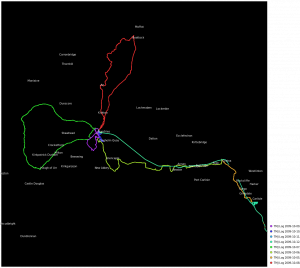 This entry was posted in Creative Commons, Maps, OpenStreetMap, travel on October 2, 2011 by smsm1986. About to dock in Calais. About to dock in Calais., a photo by smsm1 on Flickr. This entry was posted in Cycling, travel on September 9, 2011 by smsm1986. I recently headed over to France for another weekend cycling trip. This time I stayed the night in Oostende, Belgium, so that I could cover more distance in the trip on the continent. This time I headed over using SeaFrance instead of P&O since they were significantly cheaper when returning the following day, rather than the same day. I took a coastal route heading out, and a more inland route on the way back for some variety. I found it interesting to use many of the Belgian cycling facilities, including the cycle node networks and the cycle paths. The cycle node networks are quite different to the UK cycle network routes. Rather than having a route that often runs a long distance, you have fairly short distance routes between numbered points. Between the points you get signs directing you to another point. When you look behind, you’ll see directions to the point that you have just come from. This seems to work better in town/built-up areas, as it gives more of a mesh network, rather than a spoke network that the route network in the UK tends to promote. It was really nice to see cycle lanes nicely run on to the pavement as a cycle path; or priority over other junctions; or being routed behind bus stops, so that cyclists don’t need to swerve out and merge with the rest of the traffic when buses stop. When I was cycling along the LF1 beside a canal, I seen people playing some form of volleyball in canoes on the canal. Just as I was about to leave the last town in Belgium on the way back to Calais, I was flagged down by a group of 3 students who were looking for directions to get on to the North Sea Cycle Route. Having seen 2 or 3 signs for the route, I was able to give them some pointers about cycling in Belgium, as it is a bit different to the UK, and point them in the right direction. They did have maps based on car-centric Google maps showing the route and were thinking about riding on the UK equivalent of trunk or primary roads, however in Belgium (and other European countries), you are often not allowed to cycle on those busy roads, rather you are meant to use the adjacent or nearby cycle paths. When I was entering the data from my journey, I was chatting on IRC to one of the local OSM mappers, so that I could get a better idea of how the data should be entered. I learned that the North Sea Cycle Route is actually signed on the ground as LF1, though there does appear to be a coastal and inland strand of it. I am still a little confused by it being signed as LF1 in some places and having North Sea Cycle Route signs in other places, and nothing linking the two on the ground. While waiting for the ferry in Calais I had a nice chat with one of the motorcyclists and car ferry passenger. On the ferry over I had my dinner. I had pre-paid for it as you get 10% off the cost of the meal deal. On arriving in Dover there was a nice sunset over the harbour. Overall it was a total of 140 miles over two days, 125 miles of which was on the continent. I’ve uploaded the photos from my trip to Flickr. This entry was posted in Cycling, Maps, travel on October 2, 2010 by smsm1986. With the English bank holiday weekend (Scotland has the August bank holiday on the first Monday instead of the last), I thought that I would go for one of my longer cycle rides and see if I could beat my previous record of 150 miles. On the Saturday morning I packed the 4.5 litre of water, home made pasta, chocolate and extra clothing layers into my panniers. I finally got going at 1pm, which was a lot later than I was expecting. The first part of my journey was heading north to the River Thames on the Waterlink Way/National Cycle Route 21. Then I followed the Thames to the Woolwich ferry using the NCN4 and 1. I decided to add a little extra adventure to my journey by crossing the River Thames a couple of times. First using the Woolwich Ferry to get to the North bank, which is free. Then following a part of the new Cycle SuperHighway 3, which is a rebranding of the previous cycle path that it runs along, to head east towards my next crossing. To get back to the South bank of the Thames, I used the Dartford crossing. You can’t cycle over, however a free pickup truck service is provided to take cyclist and bike over to the other side. After a nice chat about traffic and cycling with the traffic officer who took me across, I then re-joined the National Cycle Route 1 most of the way to Whitstable. I decided to follow a straighter new cycle route from just before Gravesend to Strood, which is part of the old A2 prior to it being upgraded. Shortly after Sittingbourne while following the NCN1, I seen on the right hand side of the road a car with the two door windows smashed a couple of people and another vehicle, which looked rather unusual. I continued further up the road until I was out of sight, as I didn’t know how they would react and then reported the car break-in to the police via a 999 call. As I didn’t know how to describe my current location well, thus I took a photo of the screen on my phone (which ended up against my face while talking thus unable to look at the screen) with the latitude and longitude, and gave the lat/lon to the operator, which worked. On Sunday afternoon I got a phone call from the police following up with some clarifications to the useful evidence. They were pleased that I had phoned in the incident as a witness as most people would have just turned a blind eye. A bit further down the road I stopped to eat some of my pasta, and suddenly some dark rain clouds came over and the heavens opened. Luckily it was just a fairly short shower and I had managed to find a bit of shelter for it to pass. It did worry me a bit as to how much more rain there would be for the rest of my journey. Luckily once that cloud passed it was clear for the rest of my journey. From Whitstable I followed the coast, much of which was on the path or promenades that runs along the edge of the sea. As I was getting into Ramsgate at about 2 am after 107 miles, I was getting too tired to be able to continue the rest of the night further round the coast safely, so I found a nice bench and shelter overlooking the sea to put my head down for a few hours. Luckily I had a towel with me that I was able to use as a pillow. From there I headed down the short and steep downhill into Dover, the downhill was over way too quick considering the amount of uphill. I then took the train home, going the full length of the straight track from Ashford to Redhill (with a change at Tonbridge). The reason I mention it, is because it does look quite strange or unusual at lower zooms on a map, when there generally is more curves in rail lines. On the Sunday late afternoon/evening I took a nice 5 hour nap to catch up my sleep, before getting up for a few hours to catch up on a few things before heading back to bed for a full nights sleep. In total it was 133 miles over 20 hours, which is my second longest cycle in one go. The Dunwich Dynamo was 127 miles including the ride to the start. At some point in the future I want to ride from Dover anti-clockwise round the coast, particularly to try hill out of Dover and the long downhill into Deal. I’d also like to do Dover-Brighton via the NCN2. This entry was posted in Cycling, London, OpenStreetMap, travel on August 31, 2010 by smsm1986. At the start of October I took a week’s holiday up north in Dumfries in the run up to the Dumfries Mapping Party. It was a great week of mostly cycling, sightseeing and ended with a mapping party, held in the local leisure centre, DG One, which has some council meeting rooms. Heading out I was waiting on the Royal Mail delivering some OpenStreetMap reflective vests, which were supposed to have been delivered a few days earlier, though unreliable mail delivery is one downside of strike action. It meant that I had to delay my departure from home, thankfully I had bought the flexible train tickets from London to Dumfries, rather than the advance fares where you can’t change the train your travelling on and were only a couple of pounds cheaper when I was purchasing my tickets. The original trains that I had planned to get had a short, reasonable delay between them, however the train I ended up getting from London meant that there was over an hour wait in Carlisle. I couldn’t be bothered waiting, so I decided to set off towards Dumfries following the National Cycle Network Route 7, which at the time was only mapped to the edge of Carlisle. When I crossed the border, I checked the train times from Gretna Green on my phone and realised that the train that I would have got from Carlisle was due in about the time it would take me to get to the station. Sure enough I had a minute or two to wait on the platform before the train (with space for six bike at one end of the train, yeah ScotRail do know how to transport bikes unlike some other train companies I can think of) appeared. Later on in the week I completed the rest of the NCN7 from South of Dumfries to Gretna Green which hadn’t already been added to OpenStreetMap. I’ve had a little play with the Party Render scripts to produce the lovely image on the left. I customised the place names that were shown a bit to make it clearer. On the Wednesday meeting up with the local OSM contact (who goes by the name disgruntled, or known in the real world as Sally) for the first time at the Wednesday Wheelers meetup. It was quite interesting to see and hear the older generation happily cycling 10-30 miles for their regular weekly meetup. I felt quite at home considering my normal commute (well at the time) was 8-10 miles in each direction, and most people I speak to are surprised at the distance I cycle each day. Then on the Thursday I took a rather long ride over the hills of Ae and added the lcn 10 from Dumfries to Moffat. Sally had already mapped the first section of the route, which was a really nice cycle track, which had been converted from an old railway line. It was fairly flat until I got to Ae, where there is the Forest of Ae mountain bike trails, with some really steep hills that I wasn’t expecting. Thankfully just before the climb, and in time for a late lunch there was a nice little cafe, with a bike shop in the same building. Heading over the hills there were some really pretty views. It was also nice being in the middle of nowhere and only being able to hear some birdsong, and the light breeze in the trees. Once I hit the downhill, I found it pretty scary, as I wasn’t used to going down such a long hill with that style of track and occasional cattle grids. On my return I took an earlier, but late running, train to Carlisle and cycled round Carlisle to get a bunch of it mapped. I was really impressed with the way that Sally had managed to write and get published an article in the local paper. She’s also been a great local contact and mapper. Dumfries council organised the nice venue, with the event being part of the Smarter Choices, Smarter Places programme in Scotland. I’ve been uploading the photos I’ve taken to Flickr in various sets. Then importing them into CycleStreets, so that they will appear in the route listings when you plan a route in the Dumfires area. This entry was posted in Cycling, gps, OpenStreetMap, Scotland, travel on December 3, 2009 by smsm1986.